I can’t deny that I’m suffering a little NBA withdrawal these summer months, but there’s been lots to keep me occupied in the off-season. It’s not all pleasure – as excited as I am to see what Kawhi Leonard can do for the Raptors, I’m heartbroken about losing DeMar DeRozan and the break-up of the DeRozan/Lowry and Poetl/Siakam bromances. And though I don’t regret deciding to root for the New York Liberty based on their drafting of Hamiltonian Kia Nurse, no one can accuse me of bandwagon jumping in my WNBA fandom. But there’s a whole lot more going on too, so I figured I’d share some of my recent sports-related activities and entertainments. There’s always so much more happening than we can recognize with a casual glance. I likely mentioned this before, but it seemed to me that US$16.99 was a pretty good deal for WNBA All-Access, so I’ve been taking advantage of my league pass to watch some games. And I’m looking forward to the WNBA All-Star festivities this coming weekend! And there’s so much FIBA competition going on this summer! I’m following most of it via Twitter rather than tuning in to any games. But I was on the scene for this year’s FIBA U18 Americas championship in St. Catharines in June, and had a great time volunteering for the event. More recently, I joined some friends at a Hamilton Tiger-Cats game. Johnny Manziel was there for the team intros but didn’t play. And the TiCats lost after gaining a lead in the first half. But it turns out I’ve learned enough about football to really get into the game and had a great time. And the live music performance at half-time from Toronto’s The Beaches was an unexpected pleasure. Also, kudos to Hamilton Street Railway for providing free bus rides to folks attending the game. 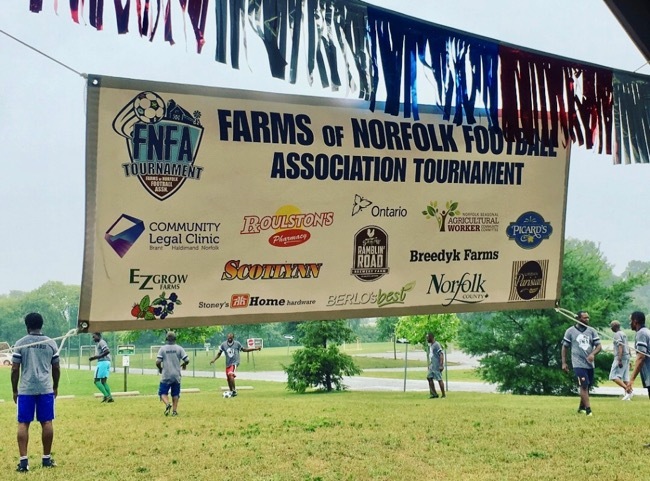 On top of all that (as well as a small taste of TSN’s World Cup coverage), I got to be there for the inaugural Farms of Norfolk Football Tournament. Six teams of Norfolk County folks, soccer enthusiasts and migrant farm labourers battled it out for the first FNFA trophy and it was a blast, despite the rain. EDIT: By the time I wrote all of the above, I’d somehow forgotten the thing that triggered me to write this post in the first place – a history podcast episode about the origins of particular sports!